Taken while returning from California visit to our son and his family for the Christmas Holidays. Wow! I have seen some sunsets that have stopped me dead in my tracks, and this is now definitely one of them! This should have scored WAY higher! Whoever gave you less than an 8 should be ashamed. The LORD evidently made Arizona with a double-barrel Creation "gun." Awsome sunset, love how vibrant it is. Would be cool if the silhoutte of somebody was standing up on the ridge, but this is still rad. Another magic image, which has the wow factor.....Fablious firey sky. Beautiful colors. Wonderful landscape. I wouldn't change a thing. 10 from me...good luck! beautiful! Wow, Love this one, Great colors. Nicely done, we DO have the bet sunsets in the world....ok, Yes I'm a bit biased! Nice vivid colours, very beautiful. Well done. Marvelous. This is why I keep trying. 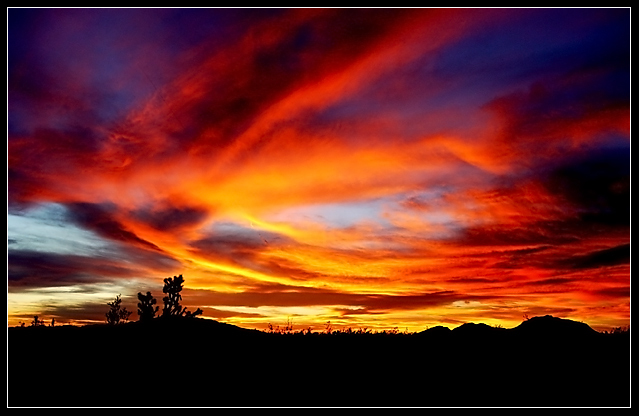 Magnificent colors in the sky! What a pretty sight. Oh wow! How amazing an artist God is. Beautifully captured! Stunning, vibrant colors. Wow. Nice feeling of depth. Great capture! Love the deep rich colors! Nicely done! Proudly hosted by Sargasso Networks. Current Server Time: 04/23/2019 08:33:57 PM EDT.